Now that I have transitioned to Microsoft as a full time FTE, I have a new blog site I’ve been writing at. Here is a link to be new blog. If you follow my blog, please make sure to update so you continue to get notified! Back in the beginning of May, Microsoft announced SQL Server 2016 and the massive amount of new features that are going to be released. Combining this with all of the Power BI enhancements and Azure enhancements that are being released, it is a great time to be a Microsoft BI professional. This afternoon the SQL Server team has now released the first publicly available preview for SQL Server 2016, as referenced in this blog post! The download is available here. If you’ve forgotten all of the amazing new features that are scheduled for release with this version, be sure to check out the data sheet. Whenever you are loading a data warehouse, often one of the most time consuming tasks is writing the update statements that you need in order to properly handle changing records coming from your system. Further adding to development time, columns are then split into type 1 or type 2 attributes, and in my current shop, processes for deletes out of the source system as well. After you write a few of these, that loving feeling you got when you started starts to dissipate, and you start to feel bored with the same statements. So with that in mind, I wrote the below procedure that takes a table name and an update_type variable of U, V, or D and then generates the appropriate update, type 2 version, or delete statement you need. The procedure makes 2 assumptions, one in that you have a separate etl_working database to handle set based updates, and the second that your table primary keys contain of column named “version_key” as a part of the naming convention for your tables primary key. If this isn’t your naming convention, feel free to change it. UPDATE: 01/21/2015: found a bug in the version code, fixed. Sorry about that! code below on lines 55,58,65, and 67. “version_key”. if you do not use this naming convention, you can update them in the where clauses of the column selects on lines 34,40,46, and 52. As always, with any code you find on the internet, test and use in development. I’ve blogged in the past about the Default Buffer Max Rows property in SSIS, and how powerful it can be. As a recap, there are 2 properties in SSIS that control the amount of data that your ETL package will hold in any given buffer: The DefaultBufferMaxRows property, and the DefaultBufferSize. When performance tuning SSIS packages, we can modify either one of these to adjust how much data SSIS can carry through a buffer at once. By default, this is 10,000 rows or 10 MB. One thing I didn’t like about my “CalculateDefaultBufferSize” spreadsheet is that it made an assumption that you were going to change your DefaultBufferSize to 100MB. So this is 100 MB per component that is running in our data flow, which can become extremely costly. If you leave it at the default however, you’re still using 10 MB per component no matter what. If we have a really skinny data set we’re importing (such as a fact table or a hub), it’s very possible we could be leaving a lot of empty space in the data flow if we stop every 10,000 rows. Conversely, if we have a really wide dataset that we can only fit 6,000 or 7,000 rows in a buffer, we’re having to make extra hops to move that same data. It’s always a balancing act. I recently decided to see if I could automate the setting of this property in order to maximize the efficiency of my SSIS packages without needing to manually calculate it out every time. giving us a result of 88,862 rows. We’ll round down to the closest 100, and that will be our default buffer max rows property. Now how do we make this dynamic? 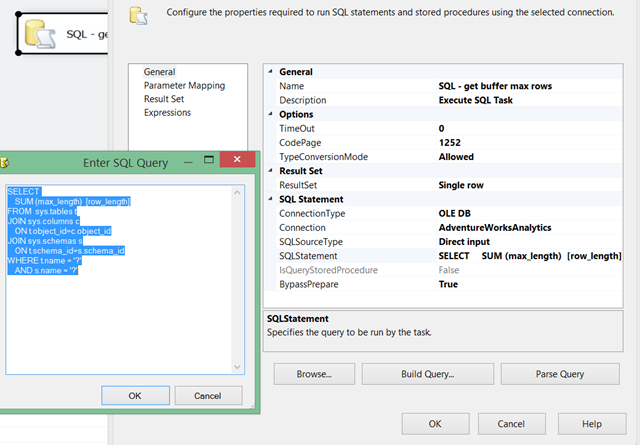 To start, we open up our SSIS package and add an Execute SQL task into the Control Flow. A good item to improve upon this would be take this and put in a Pre-Execute SQL task, and write the value to an information table. Then you can log it and do some reporting around what your buffers are. As an added bonus with this dynamic structure: as your data scales, your ETL package will too! Do the parameter mapping on the 2nd tab to parameterize your table and schema with the variables you created above, and set your result set to single row. The single row result set should map to your int_row_size variable. Now for the fun part. Create a data flow task, and right click on it and go to properties. The initial test of the value is to ensure that if the sql fails to get the proper row size, your buffers remain at the default. And that’s it! 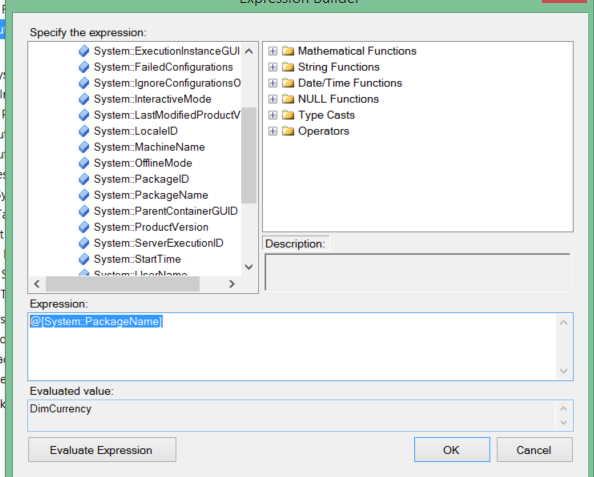 Now you can dynamically set your default buffer max rows for ssis!